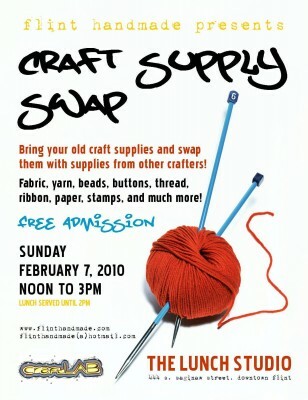 Flint Handmade will be hosting it’s semi-annual Craft Supply Swap this Sunday at The Lunch Studio in downtown Flint! It’s completely free, and a great way to trade in any craft supplies you won’t be using for some new ones! The swap runs from noon til 3 p.m., and Flint Handmade will also be selling swag with their new logo (which we love). I went to the first swap they hosted with my friend Crissy, and not only got to clean out my office and fabric stashes, I also picked up some great vintage pattern books and a bunch of neat buttons. It’s a fun event, and is sure to get your creativity sparked (plus a great excuse to not watch football). 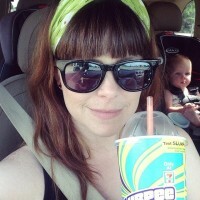 To see some pictures of a past swap, and for more information, check out Flint Handmade’s blog. Thanks so much for the mention and the love for our sweet new logo. Can’t wait for the Craft Revival…FH will be there to shop and support Handmade Detroit!